The Sun is the lord of the signs (the body), and the Moon is the lord of the naksatra (the mind). The Atma is entangled to the mind, wherever the body goes the atma must go. Therefore the naksatras are very important. 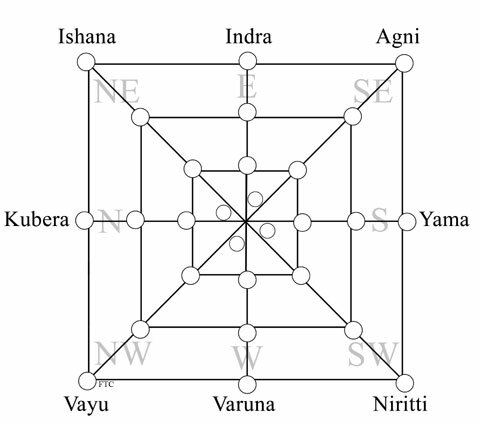 The Navatara is the 27 naksatras divided into 3 groups of nine. This chakra is used for fine-tuning the vimshottari dasa results as well as for making Muhurta specific to an individual chart. 1. Janma – birthstar, one’s own nature, most influential naksatra. 2. Sampat – wealth, it shows the kind of wealth you should possess, how your mind works in taking the resources available. 3. Vipat – danger, shows dangers to life and business, bad days. 4. Kshema – well-being, cure, time to get healed, if not healed here then can cause problems in next naksatra. 5. Pratyak – obstacles, bhadaka, can cause death or death-like suffering, if start an activity on this naksatra there will be many obstacles. 6. Sädhana – achievement, good for starting activities as they will succeed. 7. Naidhana – death, the worst of the bad stars (3, 5, 7). 8. Mitra – friend, friends who are close. 9. Parama Mitra – best friend, supporters, community, friends will meet you, good for things dealing with crowds. First cycle affects early life, second cycle affects middle life and career, the third cycle shows affects of both old age as well as the time in the womb. The 9 th nakshatra before the Moon shows the conception, and stages of development. Karma – Profession, 10th from the Janma naksatra, needs to be well placed to work properly, transits here affect one’s work. Samudayika – Crowd, 18th in cycle, samudaya means totaling or sum total, all the people coming together. Jaati – Community, caste, one’s social group, 4th in the cycle, it is the same as the kshema star, which is community, so a strong community represents good well-being (bad community will deny the proper advice that leads to well-being). Naidhana – Death, 7th naksatra, as the Janma is both a navatara and a special tara it shows that these are very important points in birth and death. Aadhaana – Conception, 19th star, this is 9 stars before the Janma naksatra which shows circumstances around the conception. Malefics will confirm troubles with pregnancy. In the Païcäìga, the five branches are each ruled by one of the five tattvas. The vära is ruled by agni, tithi by jala, yoga by äkäça, karaëa by påthvi, and the näkñatra by väyu. As väyu is the prana, the pranas of the body come from the Moon näkñatra, (this is why the pranapad lagna needs to be trines to the Moon in the Navamsa for a manusha Jataka). The näkñatra shows the strength of our pranas and any afflictions to them. Each räçi has a ghätaka näkñatra, which causes problems to the native. 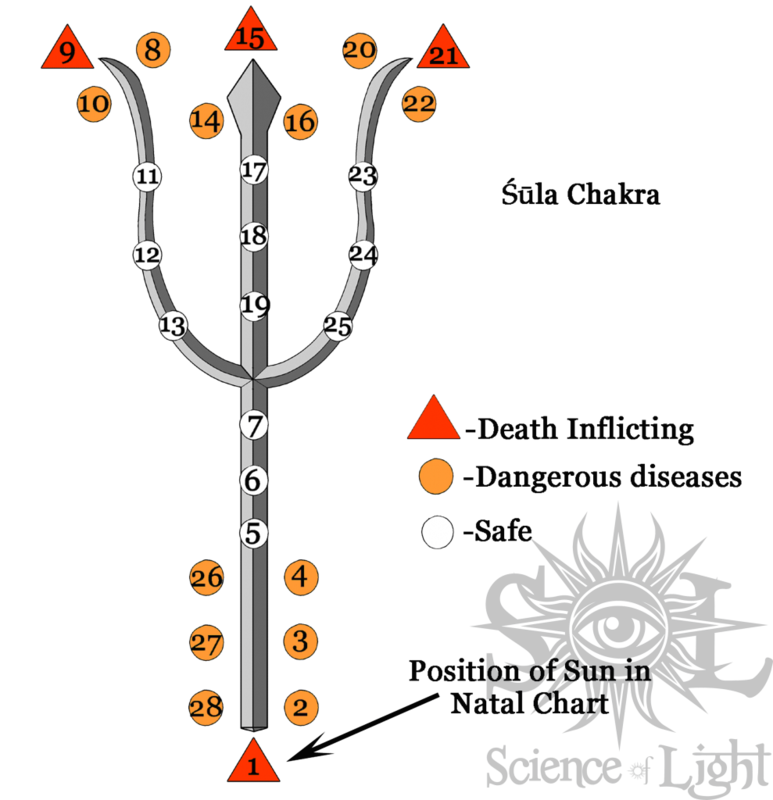 The ghätaka näkñatra is an inauspicious time, whether the Moon is transiting that star, or the Muhurta with that star in Lagna, etc, it will indicate negative results that are dangerous to the individual. Mars is the karaka for ghätaka, as it injures, hurts, kills. The näkñatra are connected to väyu, Saturn, pranas, longevity, and life. So the ghätaka näkñatra is very dangerous to life. The ghätaka näkñatra is a serious matter because it can cause death. The day the Moon transits the ghätaka from one’s own Moon, the person should not start any important things. If a person gets married at this time they may die from the marriage. If one is starting a business on the ghätaka, then the business will fail, it’s pranas will suffer. Shoola Chakra is based on nakshatras from the Sun.